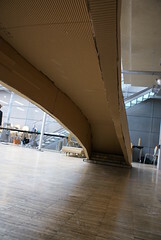 From design to fabrication in five days… This yearly workshop mixes third year engineering and architecture students in order to design and build a 6m span cardboard footbridge which must carry one pedestrian. 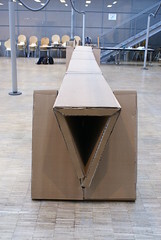 They investigate corrugated and honeycomb cardboard strength and versatility as construction materials. Moreover, such a span requires detailed structural analysis and design. In the end, students not only get familiar with all the steps of the design process but make the physical experiment with their own body of the full scale realization. Designing and building a 6m span bridge which can support one person walking. 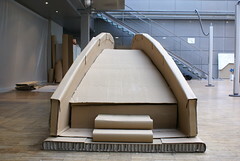 The bridge is made of corrugated cardboard and honeycomb cardboard which may be glued. Students are first in groups of five for the preliminary design. Then they are gathered in groups of ten for the construction. The cross section of this footbridge is a “H”. In conventional design of such bridge, it is necessary to add transverse struts to ensure lateral stability of the primary beams. In the present case, this is not necessary thanks to the out-of-plane curvature of the deck and the in-plane curvature of the beams. Indeed their inserction is a non-planar curve which prevent the global rotation of the beams with respect to the deck. This footbridge is foldable in a single piece of 2mx2mx40cm. It may be tranported an deployed onsite. Detailed analysis and design was required for the hinges as you may notice in the report below. In this footbridge the deck is replaced by alternate steps exactly as in japanese stairs. In order to keep the minimalism of the idea, special care was needed to ensure that the steps would really ensure the lateral stabilization of the bridge. 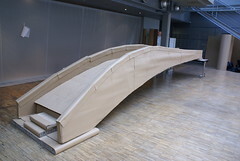 Foldable Footbridge: Capucine Madelaine, Victor Bontemps, Constance Bartoli, Quentin Jézégou, Camillia Zaninetti, Antoine François, Baptiste Lafoux, Côme de la Fouchardière, Léa Feid. Doubly Curved Footbridge: Nils Bailly, Richard Caron, Louis Fréhel, Lucas Gauthier, Pierre Gilibert, Quentin Glévarec, Flore Gustin, Sarah Kirsch, Yanis Maacha, Thomas Nantier. 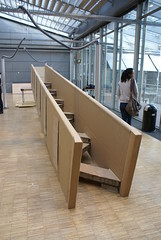 Japanese Stairs Footbridge: Alexandre Aheto, Thomas Bessard, Romain Durand, Sylvain Huchet, Katia Makhlouf, Gabriel Mayoud, Marion Okunowski, Olivier Rigal, Jessica Vatonne, Laury Zhou.